Our company Qingdao 2014 New Style! Double Deck Car Parking System Four Post Car Lifter Metal Group was founded in 1997, located in Qingdao City of China. The registered capital is 420 million RMB and total assets 2.5 billion RMB. We have two industrial parks which covering an area of more than 0.4 square kilometers. In 2013, the full automatic manufacture lines were put into use, which made production manufacture capability reach 100,000 parking space/year. We become the lead brand in parking industry. With more than 10 years' development, now we have 4 core enterprises and 1 abroad branch company, including Qingdao 2014 New Style! Double Deck Car Parking System Four Post Car Lifter Parking Equipment Manufacture Co., Ltd., Qingdao Jin2014 New Style! Double Deck Car Parking System Four Post Car Lifter Steel Structure Engineering Co., Ltd., Qingdao Jin2014 New Style! Double Deck Car Parking System Four Post Car Lifter Heating And Ventilating Equipment Co., Ltd., Qingdao 2014 New Style! 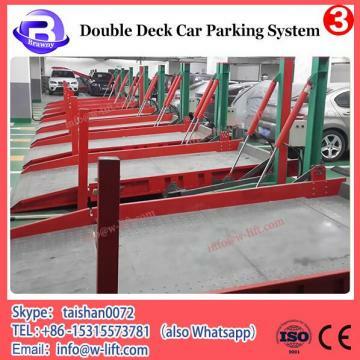 Double Deck Car Parking System Four Post Car Lifter New Energy Co., Ltd., and Pakistan 2014 New Style! Double Deck Car Parking System Four Post Car Lifter HK Co., Ltd.
double deck car parking system's a kind of valet parking equipment, suitable for both commercial and residential parking purposes. 2014 New Style! Double Deck Car Parking System Four Post Car Lifter moves only vertically, so the users have to clear the ground level to get the higher level car down. 2014 New Style! Double Deck Car Parking System Four Post Car Lifter is hydraulic driven with chains. The equipment can be used for both sedan & small SUV. With professional design and friendly package, double deck car parking system becomes simple on installation. What’s more, detailed installation manual, drawing and video attached with products will help customers have easier installation work.The posts could be shared when they are installed side by side, which can save cost, land space,2014 New Style! 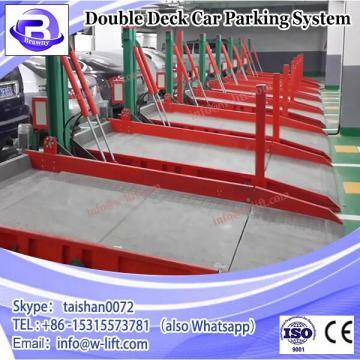 Double Deck Car Parking System Four Post Car Lifter and container space.Thanks to the hydraulic driving mode, our lift could have a faster lifting speed. Even though there is power failure, the upper car still can be retrieved by manually operating the solenoid valve.